In case you missed my big announcement on Friday, I'm pregnant with baby #6! I won't go into details (you're welcome,) but because my body and my cycle are super-weird I'm not sure how far along I am. My guess is 9 weeks, but I hope to know more after an ultrasound on Thursday. In the past, Phillip and I have always waited to announce our pregnancies until much later. After all, goes the standard wisdom, the risk of miscarriage is highest during the first 12 weeks, and you wouldn't want to announce a pregnancy and then lose it, would you? I don't even know where I first heard the advice to keep quiet until the second trimester "just in case," but all I know is that I took it. And then "just in case" happened, three times. Because we'd so zealously guarded the secret that we were pregnant, when we had those early miscarriages between 6 and 10 weeks, no one knew. Just Phillip and I. Not even our own children knew. Why I'd ever believed that keeping the 12-week rule would safeguard me, I really don't know. I still endured the grueling physical process of miscarriage and struggled with the messy emotions of grief, sadness, frustration, and anger. I just did it alone. In the days and weeks afterward, friends at church smiled and chatted with me in the hallways like they always did. Why wouldn't they? The other parents at my kids' schools were cordial as ever. Life went on just like always. Not a single soul so much as acknowledged that we'd just lost a baby, because no one knew there'd been a baby to lose. We did, eventually, tell a handful of people — namely our parents and the people who watched our older kids while I went to miscarriage-related doctor's appointments. But sharing the news afterward, saying "I was pregnant but now I'm not," wasn't helpful. It was passed, gone, something that had already happened. Whoever I was talking to learned of my pregnancy and my miscarriage in the same breath. No one was shocked or disappointed at the loss; it was just presented to them as a fact. 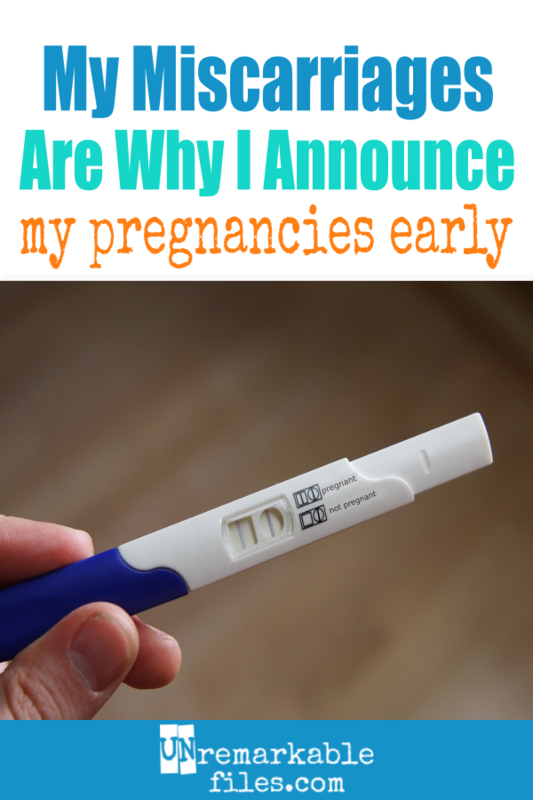 For the most part, I'd kept my pregnancy a secret and I felt so awkward about opening up after the fact, I kept my miscarriages a secret, too. 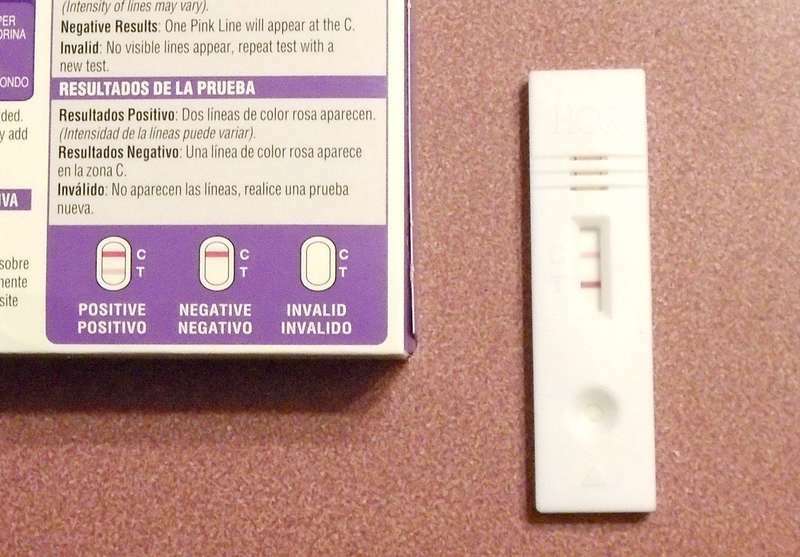 I wish I'd told someone, at least my family and close friends, as soon as I spotted two pink lines on my pregnancy test. I wished a friend could've asked me in those dark days after a loss, "How's the pregnancy going?" so that I could share what happened with someone. Instead, I swallowed my feelings when I knew I was going to be interacting with someone that day so I could keep acting normal. Waiting to announce our pregnancy hadn't made things better when "just in case" happened. It actually had made them worse. It took me years to come to terms with my miscarriages, and I think the silence was part of the problem. It was only after I "came clean" with my children who were old enough to understand, and started talking about it here on my blog, that I began to feel like I was finally processing my emotions instead of just shoving them down to wherever you shove feelings you're avoiding. Following the 12-week rule had been, for me at least, damaging. In fact, I'm not sure it's doing anyone any favors. If it weren't so common to keep quiet about a pregnancy until after the risk of losing it has passed, maybe my first miscarriage in particular wouldn't have been such an exquisitely painful introduction to how statistically common pregnancy loss is. At the time, I literally knew no one who'd had a miscarriage — none that they'd ever talked about, anyway. I'm encouraged by the openness I've been seeing on the Internet about pregnancy loss lately. I hope the stigma is disappearing. It's okay that some women prefer to keep their miscarriages private — but it's a problem when they feel like they have to. I hope that going forward, more women who lose a pregnancy in the first trimester know they're not alone. I hope that they already know friends and family members who've been there before, so they don't have to be the first ones to speak up in order to get some support. So I'm sharing the news of our pregnancy early, not in spite of the risk of miscarriage before 12 weeks, but because of it. The only times the 12-week rule worked for us was when the pregnancies were healthy ones. For the sake of those pregnancies that weren't, I wish we would've told people sooner. 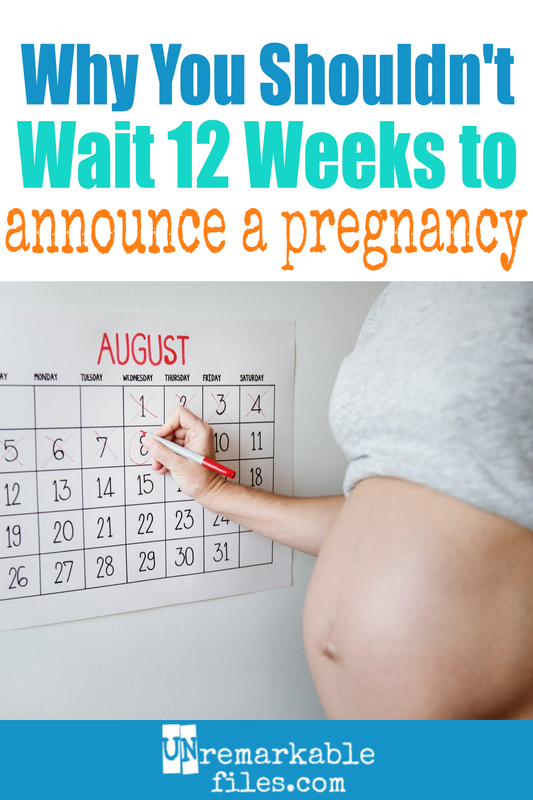 I tried to follow the 12 week rule as well- but then I miscarried right at 12 weeks. But we had certain family who we told after and half were supportive and the other half basically said it was good as we weren't supposed to be pregnant on our own (genetic disorder, long story). So when we got pregnant again we only told the kinder half of the family at 6 weeks- just cause we knew we needed that support. We didn't tell the other half until I was 17 weeks just because we felt they didn't have a right to know as they might be rude. So the half that knew early- it was fantastic to have that support. 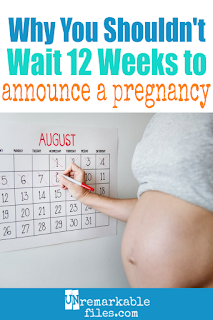 And it's emotional/hormonal/mental to go through that so I agree- it's a crappy "rule" to wait until 12 weeks. Thank you for this! This is powerful. I think there's a strong argument for sharing the news earlier, so that if the unthinkable does happen, you have the support and the understanding that you need. Great post. I never followed the 12-week rule until my 7th child. Since she was a surprise, I didn't think my older kids would be able to handle it if we had lost her and then decided not to try again. Now I can't imagine I would have done that, but at the time I was like, "Holy crap, I am too tired and busy to have another baby!" I did tell a handful of close family and friends so I would have had support there, but I just couldn't bear the thought of telling my kids if the worst were to happen. It was quite a challenge though as you can imagine a 7th baby really pops right out there early on! I managed to wait until I had an ultrasound at almost 11 weeks then tossed on the maternity clothes and looked like 4 months the next day. I didn't follow the rule... because of not following the rule, when I had a miscarriage, we had so much love and support around us. I did hesitate the next time to share the news... Worse was the hesitation and lack of connection I wanted to make to the experience. Nothing surpasses the sound of the heartbeat when you've experienced its absence. I never felt like there was a rule. I guess I naturally felt it wasn't anyone's business so I always waited as long as I could. I've had five miscarriages and only three successes. Getting a positive test isn't exciting anymore. Going to hear the heartbeat for the first time isn't exciting. So I've never been in a rush to announce anything. I've never felt like I couldn't talk about it, though. I had always told exactly as many people as I had wanted to. I'm sorry to hear about your miscarriages. They really have a way of stealing your innocence about pregnancy. I'm glad you've felt like you can do what's right for you, and that you don't have to follow some set of rules about telling or not telling people. Sorry to hear about your loss but thanks for talking about it here! It's a great idea to choose your support system wisely, and let everyone else just find out when they find out. Yeah, I feel like the moment I found out I was pregnant I no longer fit into any of my pants. Funny how that works. What a succinct way of describing both the heartache of a miscarriage and what it feels like to be pregnant afterward. Sorry about your loss but glad you had support to help you through it. I completely understand this. I miscarried a baby between my two kids and it was really hard to not have anyone except for my husband and I know. The only good thing that came from that is the understanding of what it was like to have one. I was able to relate to a friend who recently went through that but had been brave enough to tell people she was expecting early on. I totally agree with telling people early. I definitely agree that being there for others is the silver lining of having a miscarriage. I believe that everything has a purpose and I struggled for a long time with what I was supposed to be learning from my losses, and that was what finally made sense to me. And I'm very sorry for your miscarriage. I've been reading your blog for a while and never knew. Ah, Jenny. I'm so sorry for your 3 losses. Thank God, you're finally able to talk about them, and get some relief from your bottled up emotions. Do Mormons believe the babies are in heaven waiting for you? Jenny, i am so sorry for you losses! Thanks for the post. Miscarriage is such a quiet topic and untill i had one myself earlier this year i didnt realise how common it accually is! Mine was a missed miscarriage and it was only at a scan i ve found out... I could see a baby, but no more heartbeat. I kept my pregnancy secret and it was ackward to find answers to those " how are you" style questions. When i opened up to people about my miscarriage, i was shocked... All but one said: " me too" and shared their story. Now, 5 & half weeks pregnant I am not following the "12 week" rule; just in case things dont go to plan and i happen to need all the support. Thanks for bringing up the topic, Jenny & all the best for your pregnsncy! It takes your breath away when you consider the sheer number of "me too"s you get, even from people you've known well for years and had no idea. I wish we as a society were more open about it, so that when you have a miscarriage you can say to yourself "I know X, Y, and Z people who've miscarried so I know I'm not alone and maybe they can offer support" instead of not knowing a soul until you're the first to open up an everyone else says "me too." Yes, definitely. Although I do have to settle with some degree of "I don't know, I guess I'll see when I get there" because 2 of them were anembryonic pregnancies where there was no fetus inside the gestational sac. So were there babies in there or was it just my body mistakenly thinking it was pregnant? Was an egg fertilized? I'm not a scientist so it's something I need to take on faith and at some point probably after I die, God (who is the master scientist) can explain it all to me. Thanks for sharing your joy for the sake of joy, but also to have a community if things don't go as planned. You are taking care of your heart. Thank you for opening up! I never miscarried. It took me almost four years to get pregnant the first time, so maybe the Lord thought that was hard enough. Who knows. I think your approach is the right one, though. Especially in the church, at least I would like to know if someone is suffering so I can bring a meal, watch a child, or do some cleaning if she'll let me. I've been served like that so many times and it feels good to be able to give back. I hope this pregnancy is smooth sailing. Six is awesome! Congratulations and best wishes! By the way, it's been a few months since I visited and I like what you've done with your site! And thanks for commenting on a few of my posts last month! Thank you! Right now I'm 10 weeks along and haven't dropped dead from exhaustion yet, which is about the best I can hope for at this point. But so far, everything's looking good with the baby. So smart of you to get support after the fact. I wish I'd been smart enough to do the same thing. Sorry again about your miscarriage but I'm glad you're feeling more at peace about it now. You know this is really great. After my first miscarriage I announced early with the others. It allowed people to give me a break and also to be honest when setting limits for what I could do. You know what? I didn't even think of it before but it is SO helpful that friends know I'm nauseous and exhausted. I have a friend who's been calling and offering to have my preschooler over once a week since she found out, and others who've offered to watch kids or bring dinner because they know how the first trimester feels. In the past when I've only announced my pregnancies once I've hit the second trimester, everyone asks, "How are you feeling? What can I do for you?" Well, I'm fine now and I don't need anything - but I really could have used some help 6 weeks ago when I spent all day every day dying on the couch! This is something I'm obviously wondering about now. Because it took a surprisingly long time to get pregnant in the first place, I was very eager to announce quickly. We told my parents and my sisters who live here hours after we found out--that was pretty necessary since we live within walking distance from them and see them every day. We told the rest of our families a week later, and then some friends after our first doctor's appointment that confirmed baby was where she was supposed to be. I'm very glad they all knew, otherwise my behavior of the last few months would have been completely incomprehensible and everyone would have thought I was off my rocker. I don't know how I'll feel next time--a part of me does feel guilty for getting the whole family excited and then having to make them all feel sad. I imagine when we'll announce next time probably depends on how long it takes till next time--if it's soon, we'll probably wait longer but if it takes a long time again I don't think I would wait. 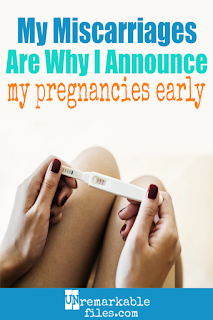 The right time to announce is different for every couple and even for every pregnancy depending on where you are in life. So sorry again to hear about your miscarriage. Whatever you do, I wouldn't feel guilty about getting your family excited and then sad - if you asked any one of them they would say they wouldn't have wanted you to keep it a secret and have to go through it alone just to spare their feelings! I've been blessed to be pregnant 14 times and we have 7 living children. I never uneed stood not telling until after the first trimester...we covet the prayers of others when we conceive, regardless of the outcome. If baby dies, we need others' support and more prayers. When I was about 16, my mother told me of her miscarriage between my older brother and me. She worried she had caused it by overdoing one day. So read up on miscarriages, and found that probably was not the cause. But it was good she did, when I miscarried after my third child, I knew it was not my fault. I was devastated as I lay on the couch after a D&C and watched the airlifts of children from Viet Nam. I was so afraid I would never have another baby, and even sent away for adoption papers. It wasn't until I was pregnant again four months after my miscarriage, that I thought rationally again. During my last pregnancy when I did announce it right away, I ended up carrying the pregnancy to full-term, but I found I needed the support and help just as much during a very sick and exhausted first trimester! Grief makes you act crazy. I totally get that. I didn't personally know of any family members or friends who had miscarried when I did (I found that out later,) but thankfully I did know that most miscarriages, especially first trimester miscarriages, are due to chromosomal abnormalities that are definitely not affected by anything you did or didn't do. So I never carried that guilt or worry - that must have been terrible for your mom to carry on top of her grief until she did some research. I'm so sorry. It really makes a difference to have support. Even if you don't tell the entire world, just letting a few close family or friends know can make a really important difference.